Mark Your Calendar for the Spring Open House & Native Plant Sale! Friday, April 26, 10 a.m.–4 p.m.
Saturday, April 27, 10 a.m.–4 p.m.
Sunday, April 28, noon–4 p.m. Prepare for spring in the garden! Shop the region's largest selection of landscape-ready native trees, shrubs, perennials, ferns, and grasses for spring planting. Guided walks, discount for members. The Adkins Arboretum Native Plant Nursery has offered the Chesapeake Bay gardener the largest selection of ornamental native plants for more than 10 years. For information about special orders, special pick-ups, help with plant choices for restoration projects, or pricing for nonprofits or commercial contractors, send email to nativeplants@adkinsarboretum.org. Adkins Arboretum’s container grown native plants are guaranteed to be true to name and healthy upon purchase. Please inspect and count all plant material upon receipt. It is our aim to provide quality plant material; however, we do not give a warranty as to the future life of the plants. In rare instances, claims will be considered, and in those cases, it is mutually agreed that Adkins Arboretum’s total liability is limited to refund or replacement. Regarding Presale Orders: Native plant presale orders are accepted based on confirmed orders from our network of growers; however, all plant material is subject to crop failures, damage by natural causes, and conditions beyond our control that may render them unavailable for purchase. If one of these instances should arise, we will contact you prior to the plant sale to arrange a replacement if possible, or otherwise will arrange for substitution or refund as requested at the time of order pickup. 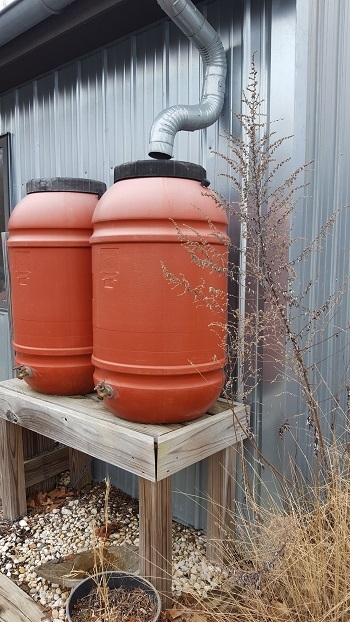 The Arboretum sells plastic rain barrels that are used to collect and store rainwater for irrigation. The barrels come already retrofitted with hose attachments and screen lids to prevent mosquitoes from laying eggs and breeding. They are a fun way to conserve and store water and add interest and beauty to the garden. We source our rain barrels from Rain Barrel International, which recycles food-grade barrels and turns them into rain barrels. Rain barrels are $85; to purchase one, inquire at the Front Desk.